As Noodle goes through his day, he has an excuse for every poor choice and behavior. He consistently blames someone or something else. When he gets in trouble, he exhibits a “poor me” persona. At the end of the day, he has a talk with his teacher. She tells him: “I’m not talking about whose fault it is…I’m talking about whose responsibility it is.” This response is perfect! I love how she changes the focus to get at the heart of the problem. She goes on to tell him, “You are responsible for the things that you do….Blaming others is a reason, but it is not an excuse. If you keep playing this game, you surely will lose!” Wow! More excellent insight for children as well as the parents and educators guiding them. The game metaphor is effective because children tend to love to play and to win at games. It is a concrete way for them to understand the consequences of their choices. When Noodle gets home, his mother reinforces the guidance his teacher offered him. She separates the behavior from the person. He made some mistakes, causing him to have a rough day. However, he is in charge of his body and mouth, so he must “own up and become more responsible for the choices” he has made. However, it is clear that he is not a “bad” kid. The next day when Noodle runs into a problem, he takes responsible. He learns there are both consequences and benefits of doing so. Rounding out this book is a list of 9 effective suggestions for parents and educators to help them teach children to avoid the blame game and take responsibility. 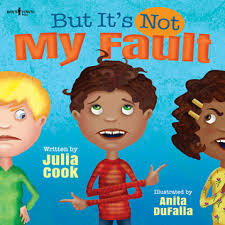 It’s Not My Fault is an excellent teaching tool for home or the classroom. I HIGHLY recommend it as a means to help refine and refocus your approach as well as a springboard for discussion with your child. 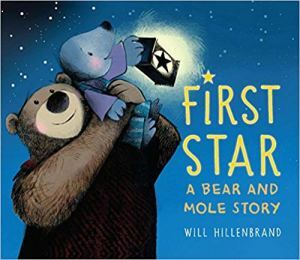 Boys Town Press has dozens of books and resources to help parents and educators. Book Talk: Discuss each one of Noodles problems and ways he could take responsibility. For instance, he could leave himself a sticky note to remind him to put his library book in his book bag or complete his homework before the game begins. Cause and Effect: Introduce or reinforce cause and effect. Make some causal chains or maps to show how one choice impacted many others. Dramatic Play: Role play common issues of “blame” your child tends to display. For instance, you can be the child (person) blaming others. Have your child “teach” you about taking responsibility. OR Use 2 dolls, action figures, or stuffed animals to play scenarios out. Problem Solving Slogan: Come up with a way to help you child remember to take responsibility. With older children, have them help you. For instance, make up a snappy saying like “Stop. Drop. Solve.” Stop talking/whining/complaining. Drop the blame game. Solve the problem. Reward Jar: Instead of penalizing a behavior (think swear jar), create a reward jar. Each time you see your child taking responsibility, allow them to pick out of the reward jar, which can include favorite activities or treats.